If you are missing a tooth or multiple teeth due to severe damage due to periodontal disease, fracture or other serious oral issues, dental implants may be an option for you. Dental implants are a revolutionary way to replace your missing teeth for a healthier, more confident smile! When you lose a tooth, our body compensates for this loss by reordering the placement of your teeth, which can cause a variety of dental problems and can also affect our physical health, making tasks like eating or speaking difficult. Dental implants will not disturb the teeth around them and will help you to talk and eat more efficiently while providing you with a more confident smile. 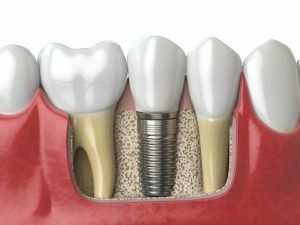 Implants are typically made from durable, lightweight titanium alloys that are compatible with bone and non-reactive to the human body, providing a strong foundation for your new teeth. These titanium posts are surgically placed in the upper or lower jaw to mimic the root of your natural teeth, functioning as an anchor for the natural-looking replacement teeth. The dental implant procedure begins with the dentist surgically placing the implant into the jawbone. Next, the jawbone will heal around the implant through a process called osseointegration. This process provides strength to the implant because the bone grows around it, holding it in place. Some patients may have to wait several months for the implant to fully integrate with the bone before the teeth are attached to the implant whereas other patients can have implants and teeth placed in one visit. After osseointegration is complete, the artificial tooth or teeth can be placed. With single tooth implants, we will customize a new tooth for you called a dental crown based on the size, shape, color, and fit of your natural teeth. If you require replacement of more than one tooth, custom-made bridges or dentures will be made to fit your mouth and implants. Provide a safer and more convenient alternative to traditional dentures which can contribute to aspiration or choking due to food blocking the airway and can be a hassle to care for. Promote good health by allowing proper chewing, which enables healthy digestion. Dental implants are an innovative way to restore your smile and give you back your confidence! At Severns Dentistry and Orthodontics, we will provide you with expert dental care and a relaxing atmosphere where you can feel at home. Contact us today to schedule a consultation to see if you are a candidate for dental implants.